For other uses, see Abdul Karim. Abd el-Krim (1882, Ajdir – February 6, 1963, Cairo) was a Rifian political and military leader. He and his brother Mhemmed led a large-scale revolt by a coalition of Berber-speaking Rif tribes against French and Spanish colonization of the Rif, an area of northern Morocco. The rebels established the short-lived Republic of the Rif. Abd el-Krim's guerrilla tactics influenced Ho Chi Minh, Mao Zedong, and Che Guevara. Abd el-Krim was born in Ajdir, Morocco, across Alhucemas Bay from the Spanish army's island presidio of Peñón de Alhucemas, the son of Abd al-Karim El-Khattabi, a qadi (Islamic judge) of the Aith Yusuf clan of the Aith Uriaghel (or Waryaghar) tribe. Abd el-Krim received a traditional education at a mosque school in Ajdir, then attended a religious institute at Tetouan. At the age of twenty, it appears he studied for two years in Fez at the Attarine and Seffarine madrasah, in order to prepare to enter the famous Qaraouiyine University. Both he and his brother M'Hammad received a Spanish education, with his brother studying mine engineering in Málaga and Madrid. Both spoke fluent Spanish and Riffian. After his studies, in 1906, Abd el-Krim was sent to Melilla by his father. He worked there as a teacher and translator (until 1913), working for the OCTAI – the Spanish 'native affairs' office – and became a journalist for the Spanish newspaper Telegrama del Rif (1906–1915). Additionally, in 1907 he was hired to edit and write articles in Arabic for El Telegrama del Rif, a daily newspaper in Melilla. There he defended the advantages of European—especially Spanish—civilization and technology and their potential to elevate the economic and cultural level of the Moroccan population. His association with El Telegrama lasted until 1915. In 1910 Abd el-Krim took a position as secretary-interpreter in the Native Affairs Office in Melilla, which brought him into close contact with the Spanish military bureaucracy and the town's civil society. In that post he gained a reputation for intelligence, efficiency, and discretion. Abd el-Krim entered the Spanish administration, first as a secretary in the Bureau of Native Affairs and later he was appointed chief qadi for Melilla in 1915. He taught at a Hispano-Arabic school and was an editor for the Arab section of the newspaper, El Telegrama del Rif. During World War I, Abd el-Krim was arrested by the Spanish authorities for anticolonial activities including alleged involvement in a conspiracy with the German consul Dr. Walter Zechlin (1879–1962). He was imprisoned in Chaouen from 1916 to 1918, then escaped. He regained his job as a judge in Melilla. At the end of the war, Abd el-Krim briefly resumed publishing in a Spanish-language newspaper, but, fearing extradition to French Morocco, he returned to his home at Ajdir in January 1919. He was alarmed by the appearance of Spanish agents in Ayt Weryaghel tribal territory and decided to fight for his tribe's independence. The following year, Abd el-Krim, together with his brother, began a war of rebellion against the Spanish incursions. His goal was to unite the tribes of the Rif into an independent Republic of the Rif; to dismantle the entire French-Spanish colonial project in Morocco, and to introduce modern political reform. In 1921, as a byproduct of their efforts to destroy the power of a local brigand, Raisuli, Spanish troops approached the unoccupied areas of the Rif. Abd-el-Krim sent their commander, General Manuel Fernández Silvestre, a warning that if the troops crossed the Ameqqran river he would consider it an act of war. Silvestre is said to have laughed, and shortly afterwards crossed the river and set up a military post of 60,000 men at the hills of Abarran mountains. In June 1921 a sizable Riffian force attacked this post killing 179 of the estimated 250 Spanish troops there. Soon afterwards, Abd el-Krim directed his forces to attack the Spanish lines at Anwal, which they did with great success. During the attack, General Silvestre, head of the Spanish forces, committed suicide after seeing his soldiers getting defeated. In three weeks of fierce battles, 18,000 Spanish troops were killed. The Rifians' colossal victory established Abd el-Krim as a master and pioneer of guerrilla warfare, and the president of the Republic of the Rif. By July, the remainder of the 60,000 Spanish soldiers who were not killed or captured had fled to the coast, and into Melilla, defeated by an army of 30,000 Rifian fighters. The embarrassing defeat of the Spanish forces at Anwal created a political earthquake in Spain that subsequently led to General Miguel Primo de Rivera's coup d'état of September 13, 1923, the installation of a military dictatorship in Spain (1923–1930), and the eventual collapse of the Spanish Monarchy in April 1931. By 1924, the Spanish forces had retreated, due to more defeats at the hands of el-Khattabi, to two isolated enclaves along the Moroccan coast. France, which in any case laid claim to territory in the southern Rif, realized that allowing another North African colonial power to be defeated by the native Berbers would present a great threat to its control of its North African territories. After Abd el-Krim invaded French-occupied Morocco in April 1925 and made it as far as Fez, France decided to take strong steps to put down the revolt. The French government, in 1925, after conferencing with the Spanish in Madrid, sent a massive French force under Marshal Henri Philippe Pétain to Morocco where it joined with a Spanish army, with a combined total of 250,000+ soldiers supported by large numbers of aircraft and artillery, and began operations against the Rif Republic. Intense combat lasted ten months, but eventually the combined French and Spanish armies — using, among other weapons, chemical bombs against the population — defeated the forces of Abd el-Krim and inflicted extensive damage on the local Berber population. On May 26, 1926 Abd el-Krim surrendered to the French at his then headquarters of Targuist (Targist). As a consequence, he was exiled to the island of Réunion (a French territory in the Indian Ocean) from 1926 to 1947, where he was "given a comfortable estate and generous annual subsidiary". It is in this exile that he continued his fierce anti-Western rhetoric, and the push to keep western trends from encroaching on Moroccan culture. In 1947, Abd el-Krim was given permission to live in the south of France, after being released on health grounds. However, he succeeded in gaining asylum in Egypt instead, where he presided over the Liberation Committee of the Arab West. After Morocco gained independence, Mohammed V of Morocco invited him back to Morocco. He refused as long as French forces were on North African soil. He died in 1963, just after seeing his hopes of a Maghreb independent of colonial powers completed by the independence of Algeria. Said al-Khattabi: born in 1933 in La Réunion. Married Egyptian woman Malak 'Akef. Died in 2007, buried in Abbasia. Abdelkrim al-Khattabi: Died in Egypt and buried in Abbassia. Men'em al-Khattabi: Died in Egypt and buried Abbassia. Idriss al-Khattabi: born in 1925 and received his higher education in Germany. He married Safia Hosni Jazairi, a Damascene woman and granddaughter of Emir Abdelkader, and widow of his cousin Rachid al-Khattabi (died in 1969), the son of Emir Abdelkrim's younger brother and close confidant, M'hamed ben Abdelkrim al-Khattabi (Minister of Foreign Affairs of the Rif Republic). 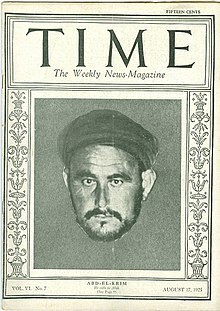 Idriss had a close relationship with Abdelkrim al-Khatib, who himself was married to a sibling of Emir Abdelkrim (likely a daughter of Si M'hamed). After his return to Morocco, he unsuccessfully tried to recover the property of his father, which the latter had entrusted to the French Résidence Générale in 1926, before his departure for exile. He was buried in Ajdir. Abd al-Mohsin al-Khattabi: Married Egyptian woman Majda 'Ashur, buried in Ajdir. Aicha al-Khattabi: Married Mustapha Boujibar. She settled in her latter life in Casablanca, where she entertained close relationships with the Palace and figures from the palace-affiliated political movement so-called Authenticity and Modernity Party. She was granted a transport licence (grima) by king Mohammed VI in return. Meriem al-Khattabi: Like Aicha, she was granted a grima by the king in 2005, and lived in Casablanca in her latter life. Died in June, 2017 in Casablanca. Fatima: Married Egytpian judge Faruq Attiya. Died in Cairo, buried in Abbassia. Menah: Married Mohsin Abdelaziz Salem son of former Egyptian Agriculture Minister Abdelaziz Abdallah Salem. She died in 2008 and was buried in Abbasia, Cairo. Rqiya: Married Egyptian engineer Mustapha Ramadan, and still lives in Egypt. Si M'hamed al-khattabi: younger brother of and close confidant of the Emir, he was sometimes Minister of Foreign Affairs and Prime Minister of the Rif Republic. He returned to Morocco in 1965, two years after the death of the Emir, but had to quickly leave for Germany to receive medical treatment for severe kidney illness from which he died in 1968. Rachid al-Khattabi: nephew of Abdelkrim, son of M'hamed al-Khattabi, went to Military school in Syria and graduated as officer. There he met his future wife Safia Hosni Jazairi, a Damascene woman and granddaughter of Emir Abdelkader. He returned to Morocco after the independence in 1956, and officially protested against the palace for the violent repression the Rif Revolt of 1958-1959. In 1959, he was appointed by king Mohammed V as Consul of Morocco in Damascus, as a gesture of reconciliation. In 1961 Hassan II muted him to Pakistan as Consul in Karachi. He died in 1969, and his widow married his cousin Idriss (son of the Emir). His son, Ahmed Rachid al-Khattabi (born in 1957), was appointed by king Mohammed VI as ambassador to Bahrain, a position he still holds as of 2017. M'hamed Khattabi: son of Si M'hamed, trained as an officer in Iraq or Syria, returned to Morocco in the mid-1960s and was integrated in the Moroccan Royal Army. He was posted as a junior officer military instructor in the military school of Ahermoumou, directed by M'hamed Ababou. After the failed coup attempt of 1971, he was arrested and imprisoned along with everybody else from the military school of Ahermoumou. He was not executed and was even released from prison in the late 1970s in unclear circumstances, but was expelled from the army. He died shortly afterwards in Rabat. Omar al-Khattabi: Born in 1926 on the French boat Abda, which was en route to La Réunion, carrying the al-Khattabi family to their exile. He was the son of Emir Abdelkrim's uncle Abdesellam and was trained as a medical doctor and surgeon in Egypt and Iraq. He settled in Morocco in the 1960s, running a clinic in Kenitra. In the latter half of the 20th-century, Omar al-Khattabi —a very charismatic person with a strong character— was the most vocal of all the al-Khattabi clan. He was amongst those arrested after the 1972 failed coup attempt against king Hassan II, and was accused of being a collaborator of Lt-Colonel Amaqran (The main instigator of the coup attempt). During his detention, he was severely tortured, and was, as a result, left permanently disabled as he had irreversible damage to his spine. After several years of arbitrary detention, Omar al-Khattabi was released, after which he continued to be a vocal critic of the regime. In the 1990s, he spearheaded efforts to open a museum dedicated to Emir Abdelkrim in Ajdir, in an attempt to preserve some of the family's history. He died in 2006. Mohamed Ziane also claims to be a distant relative of Emir Abdelkrim. Ziane stated that his grandfather was the cousin of the Emir's father (Caid Abdelkrim who died in 1915). Asprey, R.B. (2002) War in the Shadows: The Guerrilla in History, iUniverse Publishing. ISBN 0595225942. Boyd, C. (1979) Praetorian Politics in Liberal Spain, University of North Carolina Press: Chapel Hill, North Carolina. ISBN 0807813680. Carr, R. (1980) Modern Spain: 1875-1980, Oxford University Press: Oxford. ISBN 0192158287. Castro, F., Ramonet, I. & Hurley, A. (2008) Fidel Castro: My Life: a Spoken Autobiography, Scribner: New York. ISBN 978-1-4165-5328-1. Cowley, R. & Parker, G. (eds.) (1996) The Reader's Companion to Military History, Houghton Mifflin: Boston. ISBN 9780395669693. Hart, D.M. (1976) The Aith Waryaghar of the Moroccan Rif, History Fund Publications: Tucson, Arizona. ISBN 978-0816504527. Keegan, J. & Wheatcroft, A. (2014) Who's Who in Military History: From 1453 to the Present Day, Routledge Publishing: New York. ISBN 1136414169. Pierson, P. (1999) The History of Spain, Greenwood Press: Westport, Connecticut. ISBN 978-0-313-30272-5. ^ a b c d e f g h i j k l m n o "Abd el-Krim". Encyclopædia Britannica. I: A-Ak - Bayes (15th ed.). Chicago, Illinois: Encyclopædia Britannica, Inc. 2010. p. 18. ISBN 978-1-59339-837-8. ^ Tahtah 1999, p. 143 Several authors (including Azarqan, Amzyan, Ayache) have given 1882 as the date of bin 'Abd al-Karim's birth. Tahtah suggests it took place between mid-1882, based on a comparison of the available data. ^ Castro, Ramonet & Hurley, p. 680. ^ Er 2015, pp. 1-23. ^ a b Hart, pp. 370-371. ^ a b Roger-Mathieu 1927, p. 56. ^ Tahtah 1999, p. 144. ^ Ruedy 1996, p. 59. ^ a b c Pierson, pp. 126-127. ^ The date of surrender is in dispute as some sources say either May 26 or 27. ^ Cowley & Parker, p. 1. ^ Keegan & Wheatcroft, p. 2. ^ a b c "الاستاذ المحاسب المرحوم حسن وصفي محمد وصفي". Al Ahram. 11 November 2001. Retrieved 15 September 2017. ^ a b c "الاميرة‏/‏ مني محمد عبد الكريم الخطابي". Al Ahram. 8 April 2008. Retrieved 15 September 2017. ^ a b c d e f "صفية الجزائري: جدي هو ع القادر الجزائري والخطابي أمرني بمغادرة المغرب بعد أحداث الريف". Retrieved 15 September 2017. ^ a b c "صفية الجزائري: رشيد زار الريفيين في 58-59 بأمر من والده محمد بن عبد الكريم الخطابي". Retrieved 15 September 2017. ^ a b c "صفية الجزائري: أخ رشيد الخطابي كان يتدرب مع أعبابو قبل المحاولة الانقلابية". Retrieved 15 September 2017. ^ a b c "صفية الجزائري: الحسن الثاني كان يخاف أن تنقلب عليه العائلة الخطابية". 12 July 2015. Retrieved 15 September 2017. ^ a b c "صفية الجزائري: الحسن الثاني خاطب إدريس الخطابي قائلا "الصلاة لا تجوز في القصر". Retrieved 15 September 2017. ^ a b c "صفية الجزائري: ابن شقيق الخطابي عُزل من الجيش بعد انقلاب الصخيرات". Retrieved 15 September 2017. ^ a b c "صفية الجزائري: الحسن الثاني سلم عمر الخطابي مسدسا وقال له: أفرغه في رأسك". Retrieved 15 September 2017. ^ a b c "صفية الجزائري: ابن شقيق الخطابي اقتحم القصر الملكي و"شنق" على مدير التشريفات". Retrieved 15 September 2017. Montagne, R. (1954) Révolution au Maroc (in French), Paris: France Empire. Pennell, C.R. (1986) A Country with a Government and a Flag: The Rif War in Morocco, 1921-1926, Menas: UK. ISBN 9780906559239. Pennell, C. R. (2000) Morocco since 1830: A History, Hurst: London. ISBN 9781850652731. This page was last edited on 30 March 2019, at 03:51 (UTC).